A select (not exhaustive!) 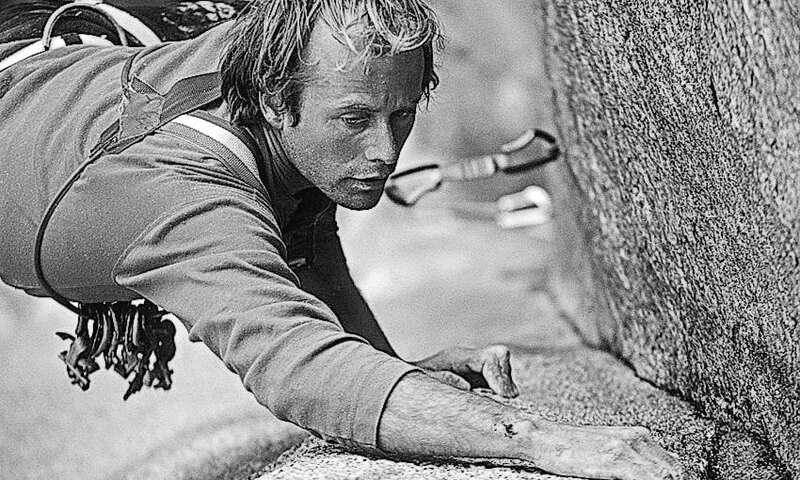 timeline of many of the major moments in the history of free climbing on the Big Stone. 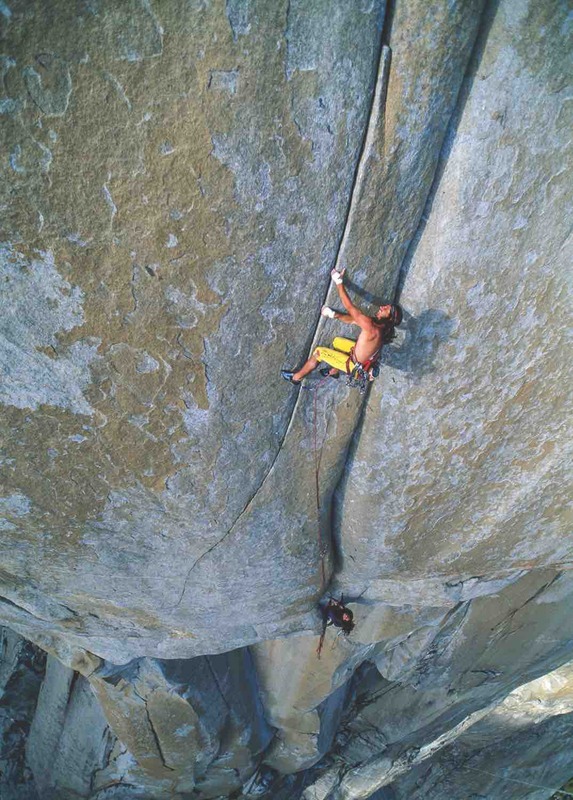 Lynn Hill on the first free ascent of the Nose, El Cap, Yosemite, in 1993. Photo: Heinz Zak. Jim Bridwell and Jim Stanton free the Stovelegs (5.10), a series of wide cracks on the lower third of the Nose, opening the door for an eventual all-free ascent. Jim Bridwell, John Long, Kevin Worrall, Mike Graham, John Bachar and Ron Kauk free the first 10 pitches of the Salathé Wall, and name their “route” Freeblast (5.11b). 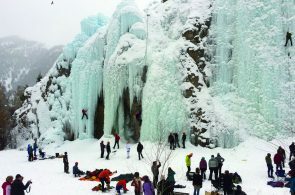 Freeblast becomes a popular climb unto itself. John Bachar, Ron Kauk and Dale Bard free 88 percent of the Nose, with difficulties of up to 5.12. This is the first real attempt at freeing a big-wall route on El Cap. The West Face (V 5.11c) is freed by Ray Jardine and Bill Price. 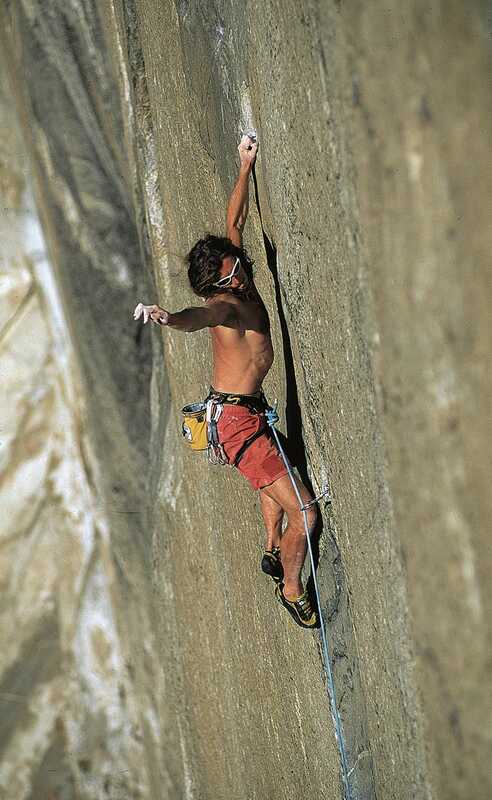 Although not on the main wall of El Cap, the climb is the first all-free route on the formation. In that vein, we also cite the East Buttress (IV 5.10b), though it is on the shoulder of El Cap. It went free in 1964 to Frank Sacherer and Wally Reed. Max Jones and Mark Hudon make the first serious free attempt on the Salathé, and in one push free all but 250 feet, 100 feet of which is wet and has already gone free. Max Jones on the Salathé. Photo: Mark Hudon. 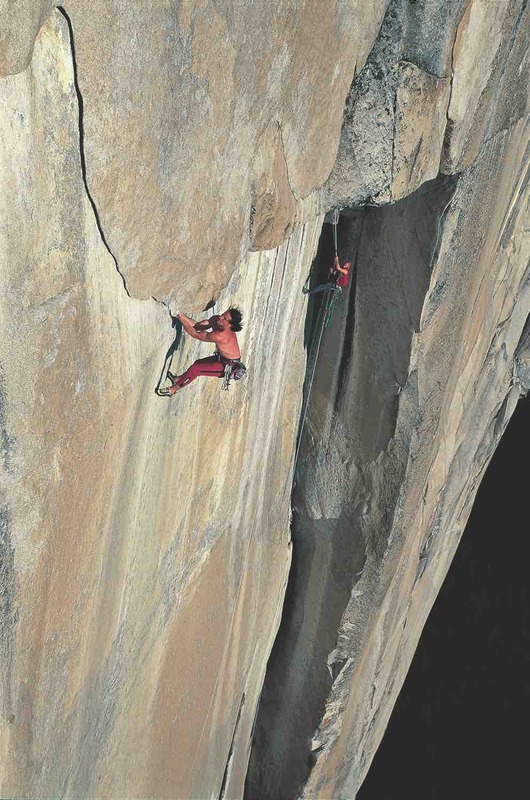 Todd Skinner and Paul Piana become the first to free El Cap, via the Salathé Wall (5.13b). After 30 days of working the route they spend nine days on the ascent. 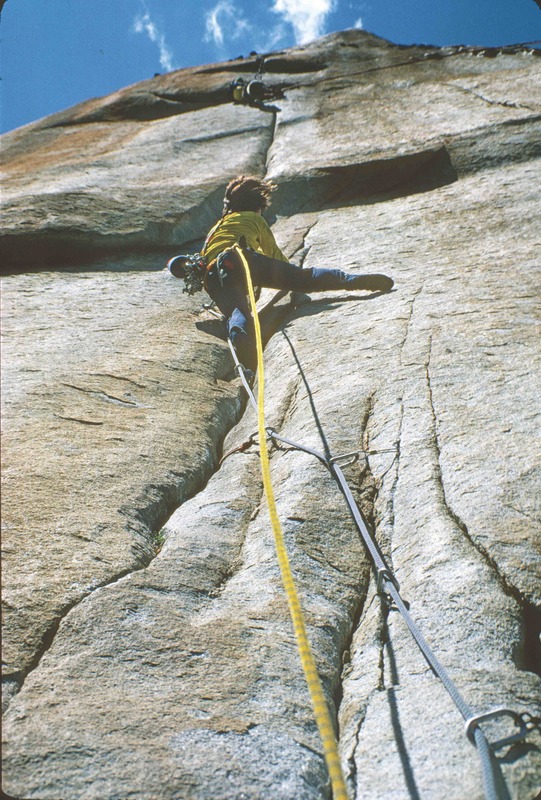 Leading the “Teflon Pitch” (5.12+) during Skinner and Paul Piana’s free ascent of the Salathé, 1988. Steve Schneider, Bill Price and Jeff Schoen free three-quarters of Excalibur (5.13 A4), including its infamous wide pitches, but thin aid pitches prove impossible. Lynn Hill becomes the first person to free the Nose (5.14a), climbing with Brooke Sandahl, who with Dave Schultz had forged a key free variation to the last pitch. Sandahl frees all but the Great Roof, trying it dry for the first time, and a variation he had devised for the Changing Corners. Lynn Hill and Brooke Sandahl atop the Nose in 1994. Photo: Brooke Sandahl Collection. 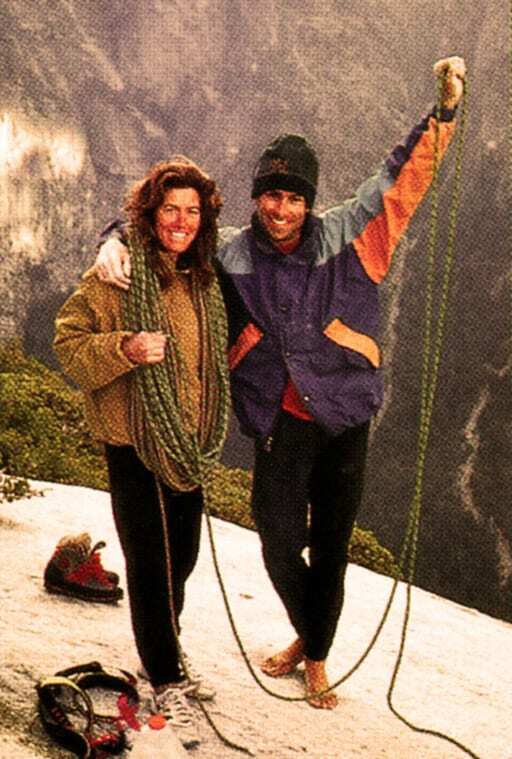 Lynn Hill is the first person to free El Cap in a day, via the Nose. Kurt Smith and Scott Cosgrove, climbing ground up, free all but a few moves on the Muir Wall. They dub their line The Shaft, in reference to the ticket they receive from the NPS for using a power drill to place bolts. Alex Huber makes the second free and first individual ascent of the Salathé, leading every pitch and eliminating the hanging belay on the Headwall. 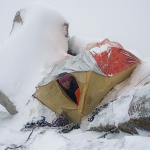 His brother, Thomas Huber, makes the third free ascent in the same style later the following year. Yuji Hirayama makes the fourth free ascent of the Salathé. He attempts it onsight and falls just four times. Scott Burk, after 261 days of effort, makes a great “almost” free ascent of the Nose. He sends every pitch apart from the Great Roof, which he topropes due to wet rock. Alex and Thomas Huber establish El Niño (5.13c) up the North America Wall section. 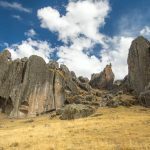 This is the first free route on the steep “right side,” the domain of the world’s most difficult aid routes. 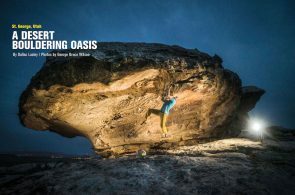 Leo Houlding and Patch Hammond make the second free ascent of El Niño. Houlding falls just once, on the first pitch, and onsights the rest of the route. Stylistically, his ascent still remains one of the best ever done. Alex and Thomas Huber establish Freerider (5.12d) by using easier variation pitches to the Salathé’s crux pitches. Freerider is El Cap’s least difficult and most popular free route. Tommy Caldwell and Beth Rodden make the first free ascent of Lurking Fear (5.13c). Alex Huber on the Salathé. Photo: Heinz Zak. Thomas Huber on El Niño. Photo: Heinz Zak. Alex and Thomas Huber establish Golden Gate (5.13b), linking the Salathé to the Heart Route. Tommy Caldwell and Nick Sagar free the Muir Wall (5.13c). Alex Huber links Freeblast to Flight of the Albatross to Son of Heart to Heart Route, creating El Corazon (5.13b). Alex Huber on El Corazon. Photo: Heinz Zak. Tommy Caldwell makes the first one-day free ascent of the Salathé, in under 21 hours. Tommy Caldwell and Beth Rodden make the first free ascent of the West Buttress (5.13c). Alex and Thomas Huber free Zodiac (5.13d), establishing the second free route on El Cap’s steep right side. Tommy Caldwell frees the Dihedral Wall (5.14a). The route stands as El Cap’s most difficult until Caldwell and Kevin Jorgeson free the Dawn Wall in 2015. Steph Davis is the first female to make a one-day ascent of Freerider. Tommy Caldwell and Beth Rodden make the second free ascent of the Nose. Two days later, Caldwell returns and free climbs the Nose in under 12 hours. Two weeks later Caldwell frees two routes in a day, the Nose and Freerider. Steph Davis is first female to make a free ascent of the Salathé. Nicolas Favresse and Ivo Ninov establish Lost in Translation (5.12b/c) on El Cap’s far right side. They place no bolts except at belays, though use some existing bolts left from aid ascents. Justen Sjong and Rob Miller complete a five-pitch variation to The Free Muir, calling their line the PreMuir (5.13d). They have spent two-and-a-half years working on the route. Tommy Caldwell and Justen Sjong free Magic Mushroom (5.14a). Later the same year Caldwell frees the route in 20 hours. Nicolas Favresse and Sean Villanueva O’Driscoll, in a ground-up ascent, link Eagle’s Way and Bad to the Bone, creating The Secret Passage (5.13c). Ueli Steck nearly onsights Golden Gate, falling only once, on a wet 5.11 move. Leo Houlding and Jason Pickles link Bad to the Bone and Eagle’s Way to establish The Prophet (5.14a X). The route features an unprotected 200-foot 5.11 pitch and numerous other dangerous sections. Hazel Findlay and James McHaffie make the second free ascent of the PreMuir; she is the first female to do it. Pete Whittaker makes the first no-falls, flash ascent of El Cap, via Freerider. 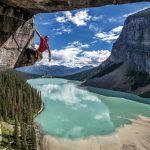 Tommy Caldwell and Kevin Jorgeson free the Dawn Wall (5.14d), one of the hardest climbs in the world, after 19 days on it. In all, Caldwell worked on the route for seven years. Mason Earle frees the Heart Route (5.13b) with Brad Gobright. Gobright frees everything but the V10 dyno on pitch 6. 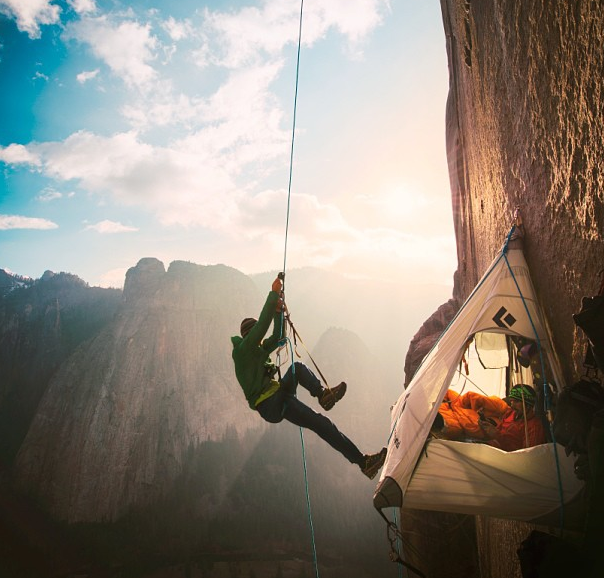 Tommy Caldwell jugging and Kevin Jorgeson in the portaledge during their siege of the Dawn Wall. Photo: Corey Rich Productions. 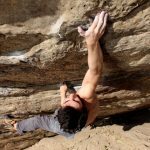 Adam Ondra repeats the Dawn Wall in eight days. 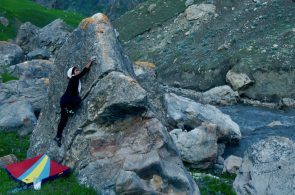 This is Ondra’s first big wall, and he has to learn everything from how to jumar, to setting up a portaledge. It is also his first big granite route. Pete Whittaker free rope solos Freerider in a day, making El Cap’s first one-day solo free ascent. Barbara Zangerl and Jacopo Larcher make the third free ascent, and Zangerl the first female ascent, of Zodiac. Tommy Caldwell made the second free ascent in 2012. Alex Honnold makes history as the first person to free solo El Capitan, via Freerider, in 3:56. Rob Miller and Roby Rudolf establish a new 39-pitch free route, The Direct Line (5.13+). Their route takes a seemingly featureless section left of the Nose, angling for the Muir Wall. It has taken Miller, with various partners, seven years to complete. Barbara Zangerl and Jacopo Larcher make the second free ascent of Magic Mushroom (5.14a), with Zangerl the first female to free the route. 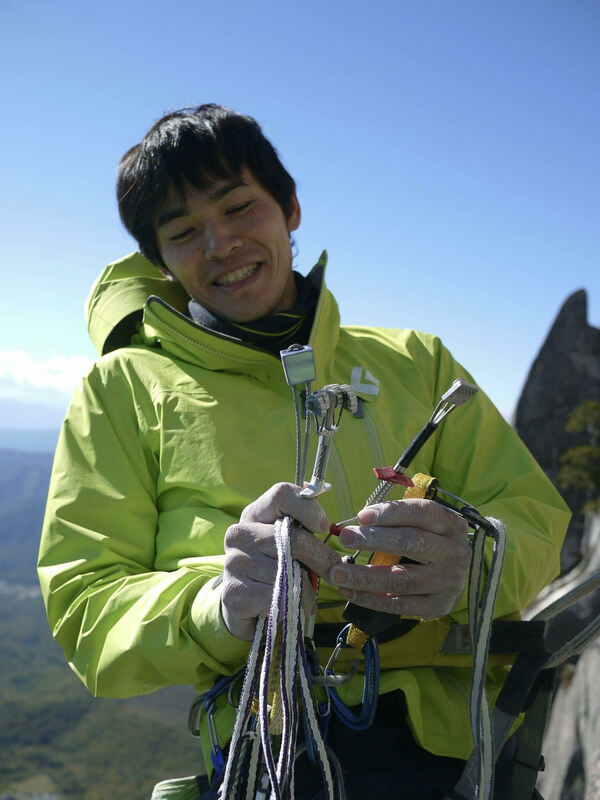 Keita Kurakami completes the first all-free rope-solo ascent of the Nose. 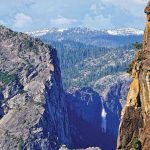 Connor Herson, at 15 years old, becomes the youngest person to free the Nose, as well as the youngest person to free any route on El Cap. His is the sixth free ascent. Keita Kurakami. Photo: Courtesy of Keita Kurakami.